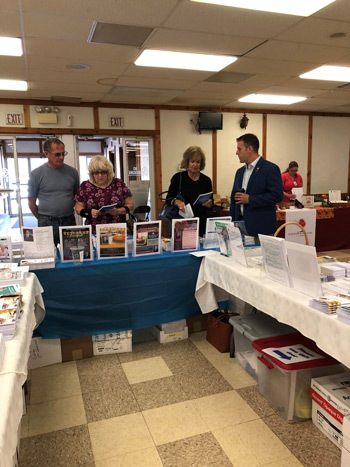 Last week, I held my second annual Senior Health and Wellness Expo at the Rostraver Central Volunteer Fire Department. Attendees gathered important information from government agencies and nonprofit organizations. It was great to see so many familiar faces and meet new people. The U.S. Small Business Administration (SBA) has approved a disaster declaration for Westmoreland County after significant flood damage to homes and businesses from a severe storm on Sept. 9, 2018. Homeowners, renters and businesses impacted by the storm in Westmoreland County may be eligible for low-interest disaster loans through the SBA Disaster Loan Programs. The SBA will establish a Disaster Loan Outreach Center (DLOC) to assist anyone who wishes to apply for a loan. The DLOC will be open on Friday, Oct. 12, at 11 a.m., at the West Newton Public Library, 124 North Water St., West Newton. The center will be open from 9 a.m. to 6 p.m. Monday through Friday, and from 10 a.m. to 2 p.m. on Saturday, Oct. 13. It will cease operations on Friday, Oct. 19, at 4 p.m.
SBA customer service representatives will be on hand at the center to issue loan applications, answer questions about the disaster loan program, explain the application process and help individuals to complete their applications. Individuals and businesses unable to visit the center in person may obtain information and loan applications by calling the SBA’s Customer Service Center at 1-800-659-2955 (1-800-877-8339 for the hearing impaired), or by emailing disastercustomerservice@sba.gov. Loan applications also can be downloaded at sba.gov/disaster. In the coming weeks, I will be hosting two free Pancake Breakfasts in the 58th Legislative District. The first, on Thursday, Oct. 18, from 9-10:30 a.m., at the Epiphany of Our Lord Church, 44 Pennsylvania Blvd., Monessen, will feature a representative from the Pennsylvania Attorney General’s Office presenting information on scams and how to prevent identity theft. Please RSVP no later than Monday, Oct. 15, by filling out the form at RepWalsh.com or calling my district office at (724) 929-2655. The second breakfast, on Thursday, Oct. 25, from 9-10:30 a.m., at the American Legion Post No. 344, 109 S. 5th St., Jeannette, will include a presentation on PennDOT’s Yellow Dot Program and additional safety-related road issues. Please RSVP no later than Thursday, Oct. 18, by filling out the form at RepWalsh.com or calling my district office at (724) 929-2655. I hope to see you at one of these breakfasts!